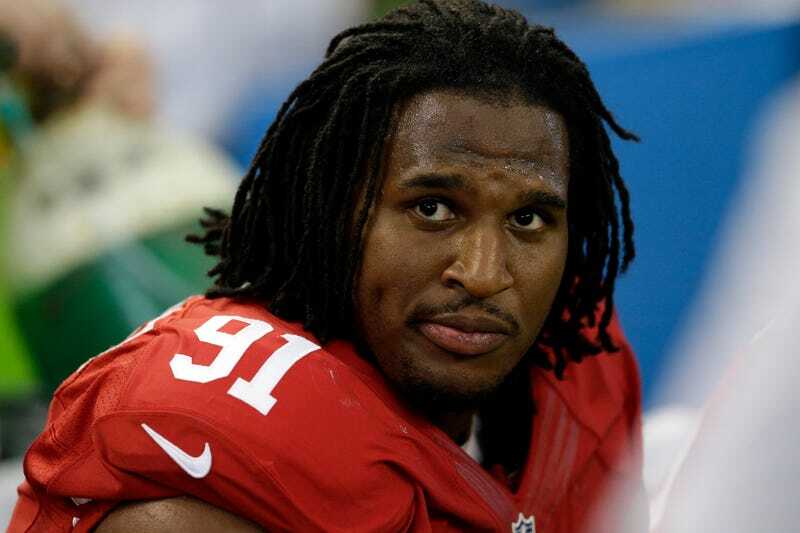 The district attorney's office in Santa Clara, Calif., announced today that it would not file charges against Ray McDonald after his domestic violence arrest earlier this year. (McDonald was accused of hitting his pregnant fiancée after they got in a fight at his August birthday party.) As part of the announcement, prosecutors also released their closeout memo, essentially a detailed explanation of their decision-making process. In this case, prosecutors hit a lot of the roadblocks typical in domestic violence cases: the woman didn't cooperate, there was a lack of verified witnesses, and McDonald said it was self defense. But what really stands out is the detail it provides on what McDonald did when it looked like he had trouble. He didn't do what most of us would do, which is call 911; he called the 49ers' security director, who put him in direct contact with a San Jose police sergeant who had done work for the 49ers and who personally went to McDonald's home multiple times that night. It started Aug. 30. Guests described the party as low-key but, as the night went on, McDonald got worried because of "texts he was receiving from females he met the night before," the memo said. He called the 49ers' security director, who put him in touch with San Jose police Sgt. Sean Pritchard. McDonald told Sgt. Pritchard he was afraid the women would show up at his home and cause problems. At one point he told Sgt. Pritchard he was afraid the women had actually shown up because one of them sent him a text describing what he was wearing. Sgt. Pritchard said he responded to McDonald's residence two separate times to address this issue. Sometime between 12:58 a.m. and 2:30 a.m., a guest was about to leave but stopped by the upstairs room where McDonald's fiancée was sleeping "to warn her that some women were getting too friendly with McDonald," the memo said. The fiancée went downstairs, saw a woman talking to McDonald, and asked her to step outside, which they both did. The memo said McDonald was upset at being embarrassed, but also worried about his fiancée's safety. When she came back inside, she went upstairs and McDonald followed. That's when the fight started. McDonald followed, saying things that upset Jane Doe. Jane Doe said he called her names, indicated that she was an unfit mother, and threatened to take her baby. Both Jane Doe and McDonald agree that Jane Doe struck first. Jane Doe said it was a single push. McDonald said Jane Doe hit him multiple times with a closed fist. (McDonald had no visible injuries or complaints of pain.) McDonald grabbed Jane Doe's arms to restrain her, resulting in visible injury. At some point they ended up on the couch. Jane Doe said McDonald threw her on the couch. McDonald said they fell on the couch. McDonald tried to remove Jane Doe from the home forcibly. At one point he grabbed her neck, resulting in visible injury. Jane Doe said she was "fighting back," physically resisting McDonald's efforts to pull her out of the house. Jane Doe said she tried to push McDonald off of her. Jane Doe was able to free herself. McDonald said he let go. Then Jane Doe ran upstairs. So what does McDonald do? He called his San Jose cop, again. McDonald called Sgt. Pritchard at 2:39 a.m. and said "I need to get this female out of my house." Jane Doe called 911 at 2:41 a.m. and said "Hello. I'd like to press for a domestic violence...my fiancé... he's trying to pull me out of the house ...he's drunk....I think he's calling the cops, he, he's trying to get me out." This wasn't the first time 49ers security got involved in a problem between McDonald and his fiancée. The memo also talks about May 24, when McDonald called 911 saying his fiancée had a gun. McDonald said she didn't point it at him or fire it. About the same time, the 49ers' security director called 911 with a different story: "He reported that McDonald had just called him and told him that his (McDonald's) girlfriend fired a gun," the memo said. No charges were filed, but prosecutors investigated. They found McDonald changed his story, saying his fiancée "did fire a gun into the ground as he drove away from his home that day," the memo said. As for the security director, the memo said he answered with he "could not recall McDonald's statement."